Step 1 In a small bowl, combine the lime juice, vinegar, sugar and water and stir to dissolve the sugar. Taste and adjust the flavors to balance the sweet and sour as needed. Step 2 Add the fish sauce, starting with 5 tablespoons and then adding more as your palate dictates, balancing the sour, sweet and salty. How much you use depends on the brand and your own taste. Aim for a light honey or amber color and a bold, forward finish. Keep in mind that this sauce is typically used to dress dishes that include unsalted ingredients such as lettuce and herbs -- ingredients that will need an extra flavor lift. When you're satisfied, add the chile. (If diners are sensitive to chile heat, serve the chiles on the side.) The sauce may be prepared early in the day and left at room temperature until serving. This makes about 1 1/2 cups dipping sauce. In Recipes-list.com we have selected the most viewed recipes from category - Main courses . Enjoy the best recipes specially selected for you! 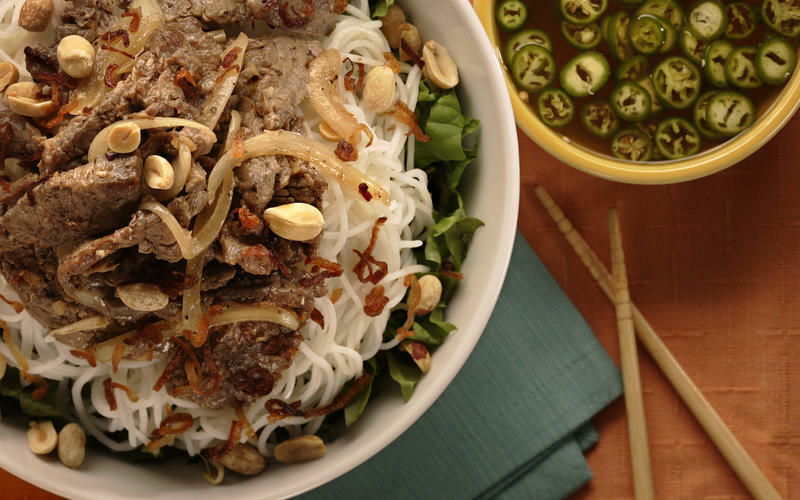 Rice noodle bowl with stir-fried beef (bun thit bo xao) is the right choice that will satisfy all your claims.